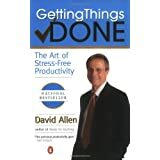 Allen, a management consultant and executive coach, provides insights into attaining maximum efficiency and at the same time relaxing whenever one needs or wants to. Readers learn that there is no single means for perfecting organizational efficiency or productivity; rather, the author offers tools to focus energies strategically and tactically without letting anything fall through the cracks. He provides tips, techniques, and tricks for implementation of his workflow management plan, which has two basic components: capture all the things that need to get done into a workable, dependable system; and discipline oneself to make front-end decisions with an action plan for all inputs into that system. In short, do it (quickly), delegate it (appropriately), or defer it. While an infomercial for the author’s consulting practice, this road map for organizational efficiency may help many who have too much to do in too little time, both professionally and in their personal lives.